Real Name: Nathaniel Jones Jr. Origin: As a young child Nathaniel was very sickly even to the point of death. His mother and father sought the help of an old African mystic who was known for healing through mysticism and herbal remedies. After Nathaniel received the medicine from the old woman his health not only returned to him but he gained immunity from all illness and enhanced strength and stamina. At age 17 Nathaniel saw his father taken from his home and lynched for a crime he did not commit. Enraged by this injustice Nathaniel sought revenge for his father’s death. His mother pleaded with him not to avenge his father’s death but to leave it in God’s hands, unwilling to let those responsible go unpunished ,he set out late one night to confront those men. On an old country road a mile away from town, the night sky illuminated by the flames of burning crosses, Nathaniel finds himself surrounded by a mob of angry white men. With hatred in their hearts the mob charged at Nathaniel desiring to tare him limb from limb. Nathaniel’s great strength and stamina was more than a match for his attackers. Suddenly an old car pulled up and an older man and his teenage son get out and come to Nathaniel’s aid. After clearing out the angry mob, Officer Fitzgerald and his son Jake check on Nathaniel to see that he is ok. Then Nathaniel asked them why they helped him fight off the white mob since they were white. Officer Fitzgerald told him that, “a man is a man and no one has the right to mistreat him.” Soon after this Nathaniel enlisted in the U.S. army at the outbreak of World War II and proved himself an exceptional soldier and all around athlete. Despite his acclaim as a skilled soldier he was a constant target of racism. Frustrated by the treatment of African Americans and people of low degree, Nathaniel decided that he would use his strength and abilities to aid those who had no one to aid them. And so began the legend of the Black starr. 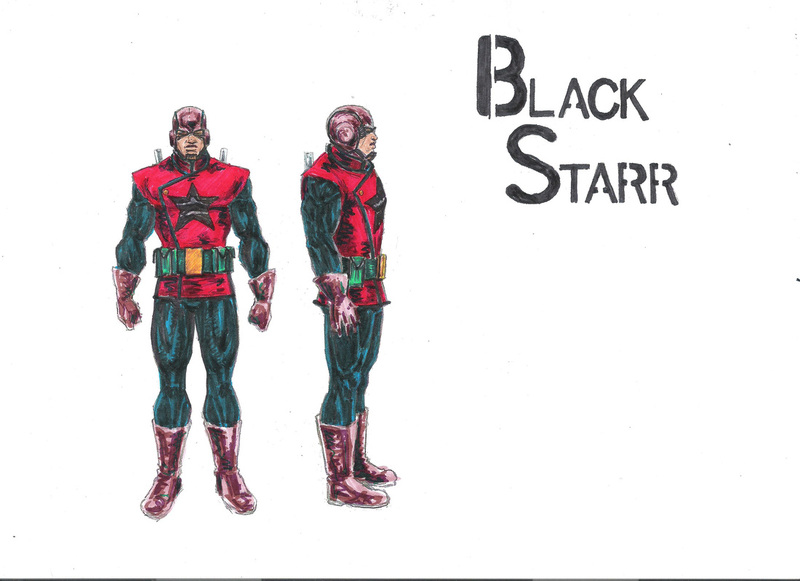 Special powers/ Abilities: Black starr possesses superhuman strength, endurance and agility. He can lift (press) 1000 pounds. His military experience has given him a broad range of hand-to-hand combat techniques and weapons training. Black starr also possesses a brilliant deductive mind and a skilled criminologist. Weapons: Black starr carries a variety of weapons and tools on his utility belt. Some of these items are light and smoke grenades, handcuffs, a shock stick (Billy club). Blackstarr where’s a battle vest that has bullet proof metal inside the front and back. He also keeps a military issue .45 cal hand gun in the case of extreme emergency.